I went with my sister who is massively into martial arts (she's a black belt ) and my mum who loves anything with a bit of action :) I couldn't take my eyes off the stage from start to finish, they were so skilled and fit, I have no idea how they manage to move like they do. I love watching any form of talent or intelligence, there is something fascinating about watching someone (not in a weird stalkerish way) do the thing that they are good at, perhaps its because I haven't found the thing that is my talent yet (if I have one!) that makes seeing people that have discovered theirs so appealing.... anyway, if you have the change to see the show go and see it! Some are a bit irregular, with differing amounts of petals which I don’t understand as I'm doing the same thing every time so surely they should be pretty uniform? It must be something Im doing differently but I haven't worked out what yet. Still, the ones I’m happy with have been turned into brooches. I’ve gone a bit crochet mad this week and even crocheted with two pieces of lace that I bought on a whim a month or two ago and had no use for, I embellished the black one with a white plastic bead and some silver seed beads just to set it off a bit. I’m really happy with the black one and will definitely be listing it in the shop if I can stop myself keeping it. I’m not so happy with the white one, I don’t know why, as you can see I’ve started to add a bit of embellishment but it just doesn’t feel right… I ll have to work on it. My last bit of crochet to show you… the squares I am sending to Africa. 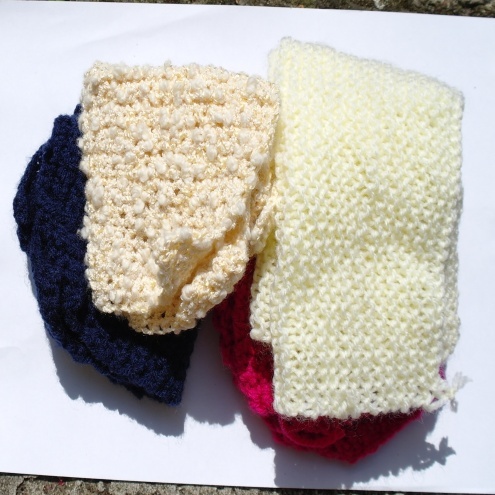 The yellow one was knitted by my mum, I have to teach her to crochet soon as its much faster than knitting. A few posts back I said how it was a shame my practice squares were going to waste, well it was Picto who mentioned this charity . It such a good idea and a lovely way to help people that need it. I’ve made a start on Christmas decorations (ahh! way to early to be thinking about that!) and have made these. I used normal string to hang them at first but thought that was a bit boring so I’ve threaded seed beads onto beadalon which I think adds a bit extra. Gosh you have been busy! How organised to be making for Christmas already. This is uncanny, it must be something in the air. I tried crochet for the first time this week too, nothing quite as ambitious as your flowers, ooooh they're so cute. I too used You tube, could you post the link you used? Thanks for the compliments,they are good for my ego! but experimented with the amount of stitches (I did 4 chain stitches instead of 2 )to see what would happen. 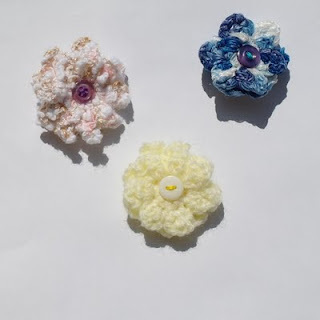 There are a few other tutorials she has posted I want to try, I just need my hand to stop aching first, crochet is addictive! 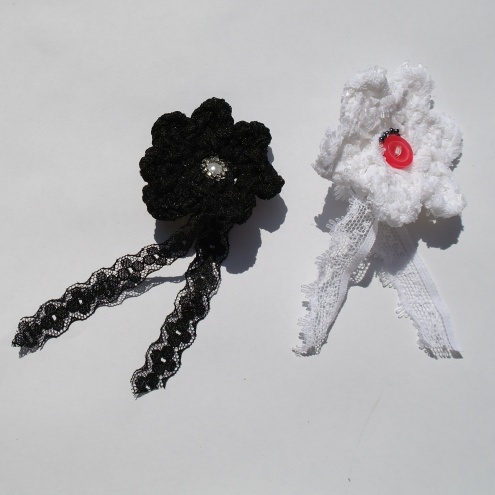 I searched for 'crochet flowers beginners' and got quite a few results. Good luck! I am so impressed by anyone who can crochet. How many times have I said this this week: one day I *will* learn to crochet! Oh, and don't worry about going crochet mad - practice makes perfect!! Lovely flowers and I love the Christmas decorations! 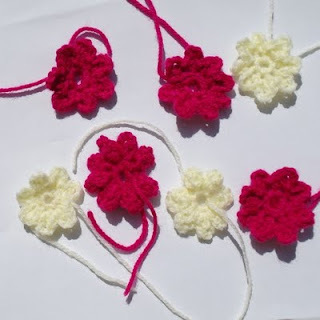 Crochet flowers are such fun to make and look so effective, Congrats on getting started on Christmas! youtube is great for tutorials, you can find pretty much anything on there. Your flowers are really sweet. Thanks for the mention, I heard about the 'knit a square' charity on the Craft Forum, I think it may of been Cosmic Grammie who first put me onto it. 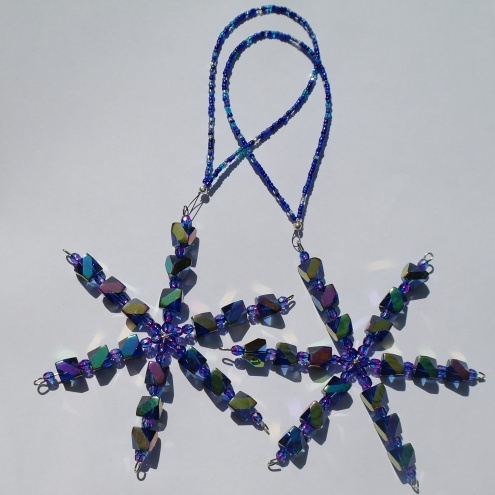 I love your beaded snowflakes, really pretty. The flowers are fab irregular or not. I used to be able to crochet years ago and I'm sure with practice I can do it again.............when I have the time. What a great idea to send the knitted squares to a charity. Those are really pretty and this is the second crochet thing I've seen today. Maybe it's a sign... Very nice! OOOhhh thanks so much this is just what I need, have only watched beginning but it's easy to follow isn't it? Have definitely got the crochet bug! Hi me again, just to let you know have given you special mention on my blog today. The flowers are very pretty, well done! Bit addictive crochet, isn't it!